Make sure the zinc supplement or lozenge you take passed our quality review and is right for you! 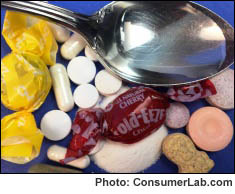 Zinc can shorten the duration of a cold, but ConsumerLab.com found that a not all products provide a dosage that's been proven effective. Zinc can also slow the progression of advanced macular degeneration of the eye, but the amount you need may be less than some products contain — and there is a risk of causing copper deficiency from taking too much zinc! Zinc supplements may be useful in treating other conditions including acne, depression, and anorexia nervosa, and, of course, in preventing and correcting zinc deficiency. But which form of zinc should you choose, and which products provide what you want at the lowest cost? The answers are in our report. We tested tablets, capsules, and lozenges, as well as a powder and a liquid, to be sure they contained what they claimed and met other quality standards.